NEW YORK -- The picture of President George H.W. Bush's service dog, Sully, lying in front of his casket was, perhaps, one of the most viewed and shared pictures following the president's death. "We all felt such a tremendous sense of pride," said John Miller, the President and CEO of America's VetDogs, based in Smithtown, which raised Sully and gave him to the president. America's VetDogs honored the 2-year-old yellow labrador on Wednesday at its headquarters in Smithtown. Sully is named after hero pilot Captain Chesley "Sully" Sullenberger, however, not merely because of Sullenberger's miraculous landing of a commercial airliner in the Hudson River, but mainly because of Sullenberger's service and training in the United States Air Force. Like all of the dogs which pass through the America's VetDogs program, Sully was raised as a puppy for a year by an incarcerated veteran. The veteran was located at a prison in Hagerstown, Maryland. 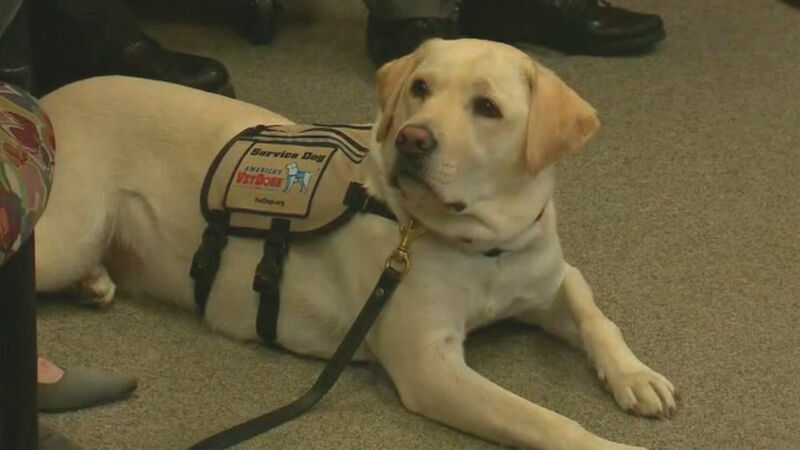 Sully's trainer, Valerie Cramer, explained Wednesday that last April, America's VetDogs, received a call from Walter Reed Medical Center in Bethesda, Maryland. George W. Bush had asked those at Walter Reed if they knew a group who could donate a service dog to his father who was coping with the death of his wife, Barbara Bush. America's VetDogs works extensively with Walter Reed, so medical center staff knew exactly who to call. Cramer fielded the call and said she knew right away that Sully was the perfect dog for the former President -- a World War II veteran. "In fact, in my excitement I may have even mentioned Sully's name," she's said. "He is loyal, calm, kind with children - exactly what the president's team asked for." Cramer said she delivered Sully to the president at his home in Kennebunkport, Maine, a short time later, around June. "From the first moment when the president said, 'Welcome home,' I knew it was an absolutely perfect match," she said. Cramer said the Bush family told her Sully and the former president shared an incredible bond and that Sully stayed with the president almost around the clock during his final days. Cramer said one of the wishes of the former president was that after his death, Sully continue to serve our country's veterans. Sully will enroll as a service dog at Walter Reed in February. He will spend the next few months on Long Island brushing up some of his training and learning some new skills that will be useful at Walter Reed. You can follow Sully's journey on Instagram, @SullyHWBush. He already has more than 264,000 followers. If you would like to donate to the raising of a dog for America's VetDogs, more information can be found here. Here's where you can find more stories about Pres. George H.W. Bush.